Image: National Cancer Institute, via Wikimedia Commons. Mutations that disrupt the gene BRCA2 dramatically increase the odds of developing breast and ovarian cancer—but such mutations aren’t enough to cause cancer on their own. 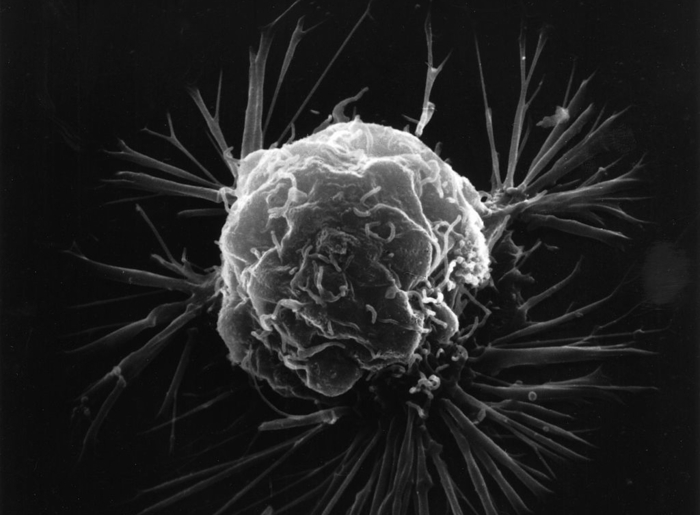 To turn normal cells cancerous, some of BRCA2’s genetic interactors must also mutate. In an article recently published in GENETICS, Ding et al. sought to identify some of these genes. BRCA2 is a tumor suppressor gene that normally helps cells maintain genome integrity, which is why its loss can lead to mutations in other genes and eventually to cancer. But losing BRCA2 function also cripples a cell’s ability to proliferate—making cancer less likely to develop, not more. One possible explanation for this seeming contradiction is that additional mutations in other genes allow cells without functional BRCA2 to survive and become dangerous. To find such genetic interactors, the researchers screened a mouse cell line in which disabling both copies of the mouse version of BRCA2 (Brca2) is lethal, enabling them to look for genetic changes that would allow cells with no functional Brca2 to survive. Their screen turned up Gipc3, which was not known to be involved with Brca2 or breast cancer; it was instead associated with certain types of deafness. Gipc3 doesn’t simply compensate for Brca2 mutants’ defects in DNA repair. The researchers observed that, although overexpressing Gipc3 allowed cells to survive without functional Brca2, it wasn’t enough to protect them from DNA-breaking ionizing radiation. This made the group suspect that other genes are also involved. Ding et al. looked for proteins that bind the protein encoded by Gipc3 (GIPC3), collecting proteins that physically associate with GIPC3 and using mass spectrometry to identify them. They found that signaling proteins APPL1 and APPL2 appear to bind GIPC3, but the analysis couldn’t show for certain that they’re involved in the pathway of interest. Using existing structural data, they predicted which parts of GIPC3 may be important for binding APPL1 and APPL2, reasoning that if they could disrupt these interactions, they could see whether the two proteins worked with GIPC3 to allow cells without functional Brca2 to survive. They found that when APPL1 and APPL2 are unable to properly bind GIPC3, most cells don’t survive Brca2 loss, indicating that APPL1 and APPL2 are critical for GIPC3’s role in protecting these cells. APPL1 and APPL2 have many functions in the cell, and it’s unclear how they work with GIPC3, which is a topic for future study. This work adds Gipc3 to a growing list of genetic Brca2 interactors that may play a role in development of breast and ovarian cancer, adding another fragment to the complex genetic story of how ordinary cells become cancerous. Ding, X.; Philip, S.; Martin, B.; Pang, Y.; Burkett, S.; Swing, D.; Pamala, C.; Ritt, D.; Zhou, M.; Morrison, D.; Ji, X.; Sharan, S. Survival of BRCA2-Deficient Cells Is Promoted by GIPC3, a Novel Genetic Interactor of BRCA2.